ARMADILLO ART & CRAFT-PanPastel Metallic Kit. The special qualities of PanPastel Colors means that artists can blend and apply dry color like fluid paint! 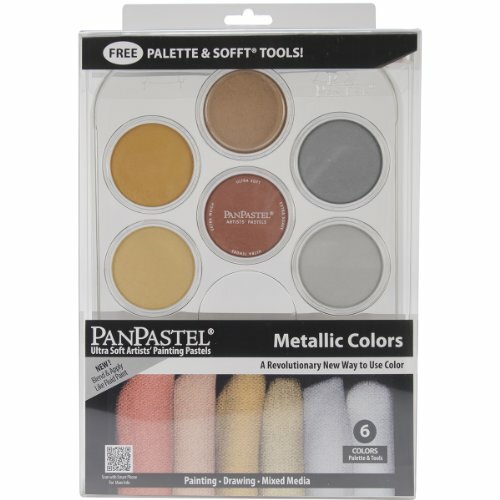 This package contains six PanPastel Ultra Soft Artist Pastels (light gold rich gold silver pewter bronze copper) one palette tray and an assortment of Soft Tools. Made in USA. The special qualities of PanPastel Colors means that artists can blend and apply dry color like fluid paint! 2 PACK SET - Pentel Arts Oil Pastels, 50 Color Set (PHN-50) 2 Sets!! By Ruby Red Paint, Inc.